One of Britain's rarest birds whose numbers climbed back from near extinction a decade ago faces a new threat from the sea. Habitat creation helped the bittern grow from a low of 11 males in 1997 to at least 51 recorded by the RSPB and Natural England last year. 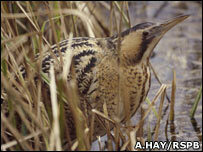 The bird, known for its booming call, is commonly found in the freshwater reed beds of Suffolk and Lancashire. But the RSPB warned these coastal sites could be lost to rising sea levels. "A substantial area of new reed bed will urgently need to be created away from the coast, and the threat of climate change-driven, sea level rise," Dr Avery said. "We know it takes at least 10 years for a newly created reed bed to support nesting bitterns but don't know how long existing sites will be able to survive against the ravages of climate change." A type of heron, the bittern is more often heard than seen with males emitting a foghorn-like cry which can be heard up to two miles away. Natural England has also said alternative reed beds need to be created inland to support the bird, such as the Great Fen Project, which aims to restore 7,000 acres of fenland habitat in Cambridgeshire. Sir Martin Doughty, chairman of Natural England, said: "Natural England supports a more sustainable approach to managing the coastline, not only for bittern but also for the entire range of wildlife on the coast. "We need to take action now."